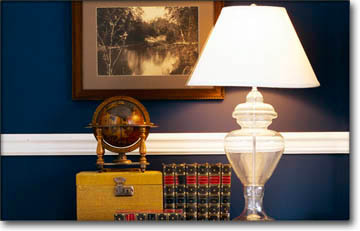 Looking for some tips for choosing the right paint colors for your home interior? Well, here it is! Knowing the principles of color lets you change the look and feel of a room for the price of a few gallons of paint and a free weekend. Color can transform a room. Pale shades open it up and give it a sense of spaciousness. Because paint colors with a lot of white in them reflect light, they brighten dark hallways and rooms with a northern exposure, which get the least sunlight. White ceilings seem higher because the color makes them appear to recede. Dark colors make a room cozy and intimate. They are often used in quiet places like studies and dens. 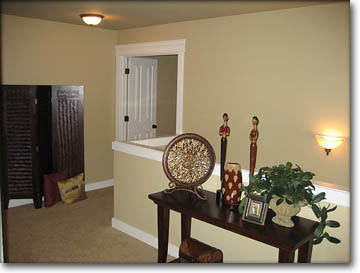 Dark colors can also disguise architectural faults like uneven walls, and they hide signs of wear in heavy-use areas. When choosing colors, blues, violets, greens, and grays in any number of tints and shades give a cool, serene feeling to a room. Intense cool colors are refreshing, while subdued cool hues have a tranquil effect. Reds, oranges, and yellows warm a room. Intense warm colors create excitement; subtler hues, sociability. Pure colors like those found on a color wheel, are neither diluted by white pigment nor darkened with black pigment. This makes them vibrant, energetic, and, in too great a quantity, a little tiring. The expanses of bright, intense color belong in active spaces like recreation rooms. Bright accents, however, can add excitement to soft color schemes. A Color Wheel – shows the interrelationships of the 12 basic colors. Color schemes based on the wheel – even in lighter or darker values – maintain color balance. A color wheel helps you see the relationships between colors. Red, yellow and blue are primary colors. Orange, green, and violet are considered secondary colors: each is created by combining two primary colors. Tertiary colors are a mixture of a primary and a secondary color. 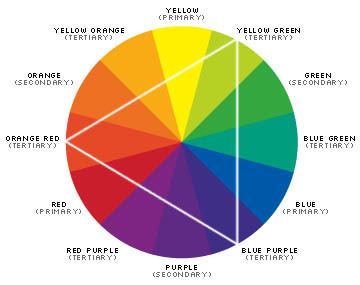 Harmonious color schemes can be diagramed on the color wheel. Choosing colors that are opposite each other – blue and orange, for example – are complementary colors and good decorating partners. For three-color harmony, use colors equidistant from each other on the wheel (triad scheme), or pick a base color and the two colors on either side of its complement (split complementary scheme). When it comes to painting, most of us are in love with paint swatches. We grab them by the handful from every display we see. 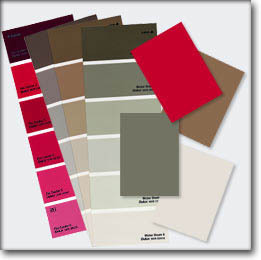 Even though most paint dealers will formulate a color for a customer through computer matching from a swatch, a lot of people come in with a sample to match to a paint chip when choosing colors. 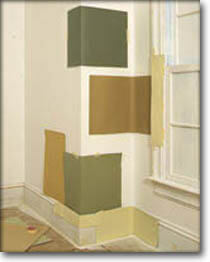 Because paint chips are small and walls are large, paint chips are only the first step in choosing colors. Paint chips help to narrow choices, but they do not eliminate the need to test a color on the wall where it is influenced by surface texture and lighting. Most paint companies sell small samples of paint so customers can apply them directly to a wall or can apply them to a plywood board to move around to really live with the color. I would suggest painting sample colors right up to trim or other surfaces that will not be painted to see the color in relationship to other colors in the room. It’s always best to try the samples on all the walls of the room since each wall will take on different lightings. Keep in mind that your furniture and other décors in the home will play a large part in your paint color selection. Try to complement your surroundings like the couch, floorings, accent pillows, etc. I’ve found a very nice tool on the Benjamin Moore’s website that is called Benjamin Moore’s Personal Color Viewer. The Benjamin Moore Personal Color Viewer (PCV) is a color visualization program that allows you to experiment with color before picking up a paintbrush. First, you select an exterior home or interior room image from the PCV’s vast pictorial library or import an image of your own home. Then create the look that you love. They offer a Professional version of the software that you can download for a cost. The website version is free and the only limitation is that you are unable to upload your own photos.